A homemade lasagna recipe does not get any easier than this! No pots for cooking the pasta noodles in and all you need is some cheese and a quick meat sauce to bring this lasagna together! Easy and so simple yet you still get the classic lasagna taste. This will probably be the only way I make classic lasagna now. It’s seriously the EASIEST LASAGNA EVER! And tastes like something from a Restaurant or from the freezer section. It’s simple because you toss the noodles in hot water while you prep the filling. Then comes assembling and you don’t even need to spread the ricotta cheese, it goes right into the meat sauce! Lasagnas a layered dish, so at the end all the layers blend in anyway’s, why do the extra steps when their really not necessary? 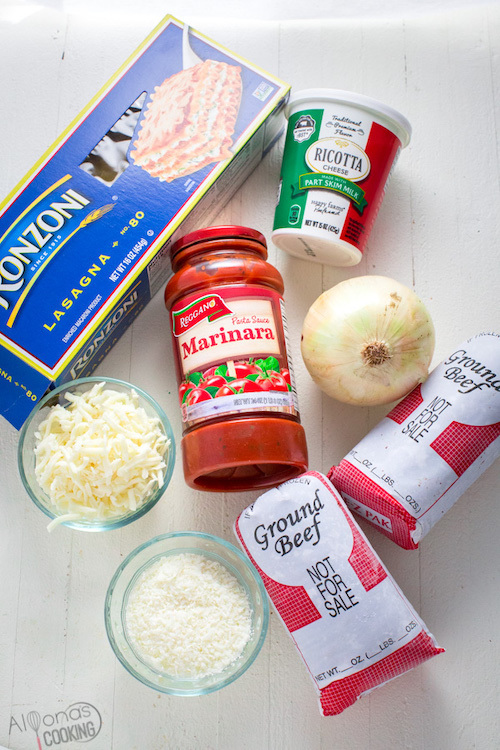 A classic Meat Sauce Lasagna to try! 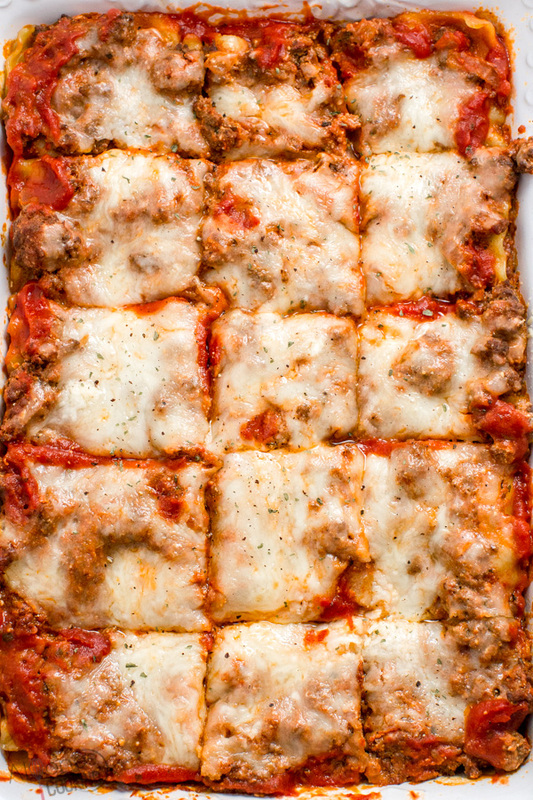 How many layers should classic lasagna have? 8 ounces of pasta (which is usually half a box or 9 sheets) makes a 3 layer lasagna dish that feeds a crowd of 6 or more people. Many recipes call for 8 oz of lasagne noodles and since that amount fills a 13 by 9-inch pan nicely, I’d say three layers or 9 sheets of lasagna noodles should be the ideal amount for a family or small crowd. Do you have to boil or cook lasagna noodles before baking? No, you can soak regular lasagne noodles in hot water or opt for oven ready lasagna noodles. Most recipes call for boiling the noodles but soaking is so simple and can be done while the other ingredients are prepping. How do you avoid watery lasagna? Watery or soupy lasagna could be results of too much sauce. However, if your noodles are uncooked or barely al dente, they should soak up lots of the sauce during baking. If you have partially cooked lasagna noodles the baking time shouldn’t be over an hour so go easy on the sauce to avoid a mush. The baking time will be more on raw noodles and the sauce should be more wet to absorb into the noodles and cook them. Do not exceed 32 oz of liquid or sauce for 8 oz of partially cooked noodles. 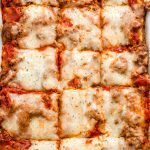 What cheeses work best for lasagna recipes? The most common cheeses found in lasagna are mozzarella, parmesan and cottage or ricotta cheese. How do you freeze lasagna? Freezing lasagna is easy. Just assemble the lasagna per recipe instructions, like you would before baking, right into a disposable foil pan. Then cool and cover with foil. Place into a grocery bag to protect from any frost and tie, then place into a freezer. When ready to bake, thaw completely and bake 45 minutes to 1 hour. How do you avoid lasagna from falling apart? Lasagna could fall apart due to excess sauce or too much filling. 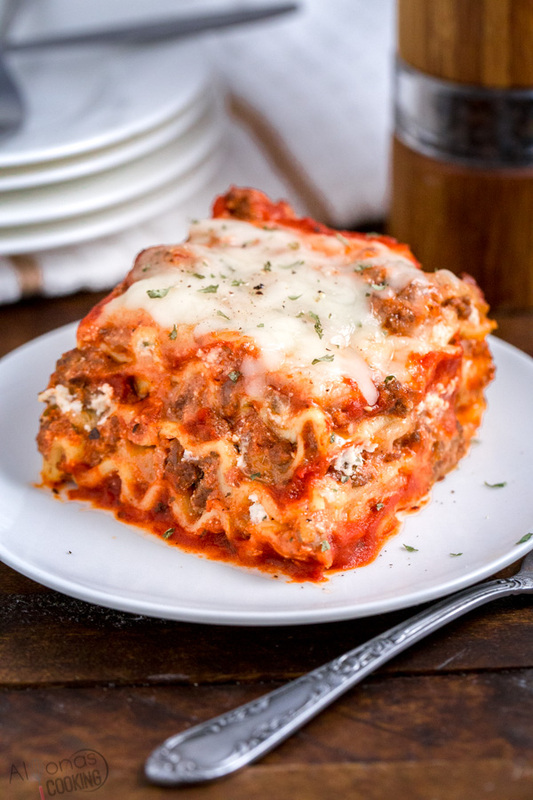 Too much sauce can make the lasagna to wet to keep its structure and too much filling can cause the lasagna noodles to slip and slide from the excess filling. Keep the sauce and filling proportional. Try to avoid the over usage of cheese or sauce for a structional lasagna dish. What ingredients make Classic Lasagna? Basic lasagna usually consists of three basic components: pasta, meat sauce and cheeses. Although there are many variations in the sauces or cheeses its the three that make lasagna. This recipe calls for ground beef, onion, jarred sauce and 3 different kinds of cheeses. SUPER EASY! 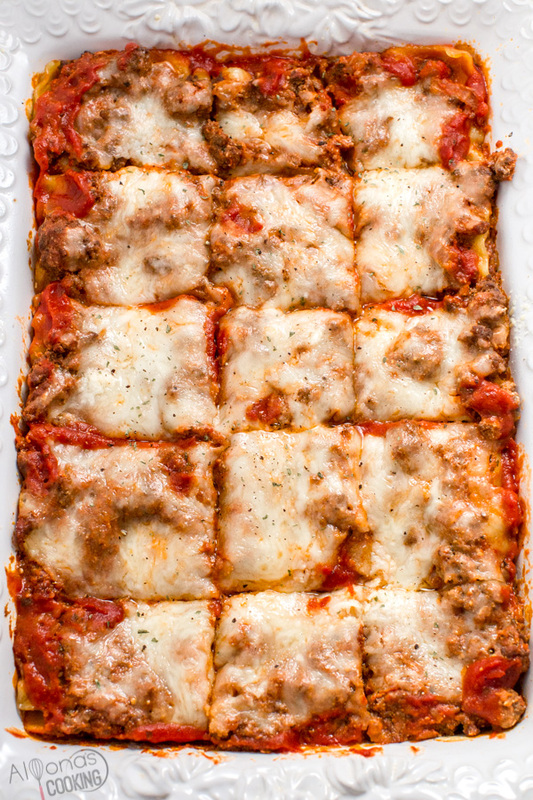 Meat- ground sausage or chicken can make substitutes for ground beef in lasagna. Ricotta cheese- if you don’t have ricotta cheese use cottage cheese or farmers cheese in place of ricotta. Mozzarella cheese- provolone or white Monterey Jack cheese can work as substitutes for mozzarella cheese. Spaghetti sauce- any jarred pizza sauce or marinara sauce can be used for lasagna and if you wish to make it even more homemade you can whip up a sauce from canned tomatoes or diced tomatoes. Soak 9 sheets of lasagna noodles in VERY hot water. Meanwhile, brown beef. Drain fat and add onion then sauté additional 2 minutes. Add the sauce and ricotta cheese and heat thoroughly. In a 13 by 9-inch pan, ladle enough sauce to thinly cover the bottom. Layer with 3 lasagna noodles, 2 cups of sauce, 3/4 cup mozzarella cheese and 1/4 cup of parmesan cheese. Repeat twice. Bake at 350° F for 45-55 minutes. 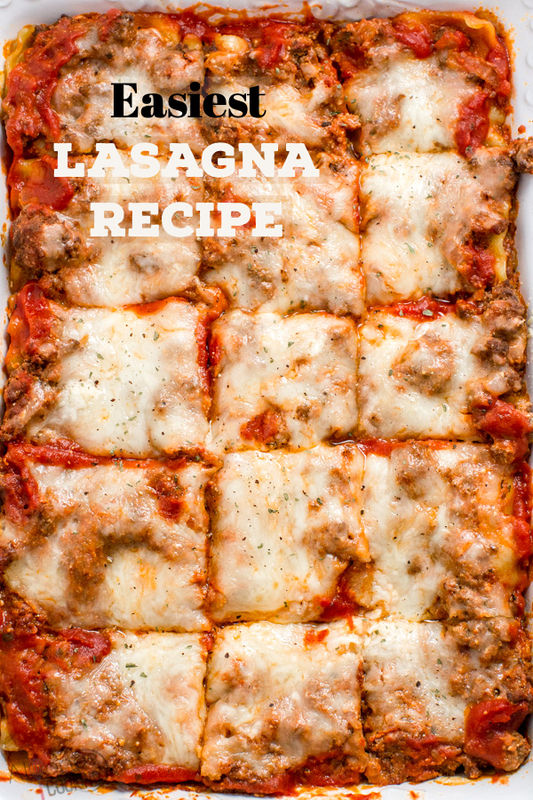 EASIEST lasagna recipe! A classic 3 layer lasagna dish, smothered in a quick meat sauce and a blend of cheeses. Easy and fast dinner! Since most jarred sauces come in 24 oz bottles you can substitute 1 (24 oz jar of sauce) plus 1 cup of water for 32 oz of spaghetti sauce. Cottage cheese can be used in place of ricotta cheese. 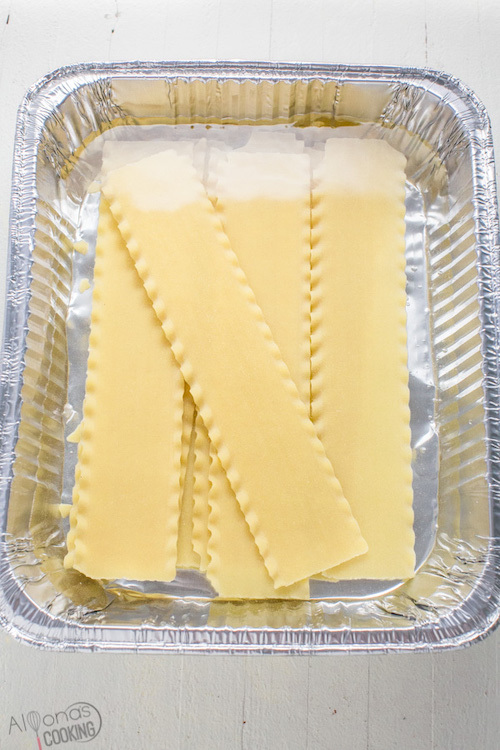 TO FREEZE: Assemble the lasagna per recipe instructions into a disposable foil pan. DO NOT BAKE. Once meat sauce has cooled, cover with foil. Place into a grocery bag to protect from any frost and tie, then place into the freezer. When ready to bake, thaw completely and bake 45 minutes to 1 hour. Boiling water will soak the noodles faster than using hot tap water. The noodles are ready to be used when they are flexible to bend without snapping.